Maths 4 Africa mathematics study guides are handwritten and makes excellent use of colours to explain the basic concepts of Mathematics in a simple, learner-friendly manner. They consist of brief summaries, colourful explanations and tips as well as appropriate examples, presenting the core of each chapter in a nutshell. These study guides are available for Grades 10, 11 and 12 in both English and Afrikaans and support the CAPS for Mathematics. Grade 10 Maths is extremely important as this forms the basis of the work done in Grades 11 and 12. It is therefore of the utmost importance to understand this work well in order to lay a good and solid foundation for the next two years. The Grade 10 Maths 4 Africa study guide helps learners navigate successfully through the maze that is Grade 10 by explaining complicated concepts in a simple manner. Colour is used throughout to highlight words, numbers or helpful tips wherever appropriate in order to enable learners to understand the work more easily. In Grade 10, learners start factorising more complicated trinomials as well as the sum and difference of perfect cubes. The Maths 4 Africa study guide offers worked examples and step-by-step guidance to ensure that learners know exactly how to go about this. In the section on exponents, learners are introduced to more complicated types of exponential equations (as is required in Grade 10). Important issues are addressed in worked examples, and helpful notes enable learners to understand what is being done in each step. The same applies to the chapters on equations and inequalities. The section on functions is extremely important. Here, Grade 10 learners are introduced to three new types of functions: parabolas, hyperbolas and exponential functions. Special attention is given to drawing graphs, interpreting graphs, interpreting equations of functions and finding the equations of functions. Probability and statistics are explained in a manner which learners will find easy to understand using helpful summaries, diagrams and worked examples. Trigonometry is introduced to learners in Grade 10. Maths 4 Africa focuses on explaining this in a simple manner and making sure that learners understand the basics of trigonometry before moving on to more complicated examples. In the section on trigonometric functions, learners are also shown exactly how to use a calculator to draw graphs of these functions using step-by-step explanations. Using exam-type questions in worked examples, learners are also taught how to interpret trigonometric graphs and equations of such graphs. In the chapters on number patterns, financial maths and measurement, the Maths 4 Africa study guide keeps things simple by summarising formulae and offering helpful hints to help learners succeed. The sections on analytical geometry (which is also new to Grade 10) and Euclidean geometry cover all important aspects of these sections. As always in the Maths 4 Africa study guides, formulae have been summarised and little notes and hints alongside worked examples help learners understand what is being done. Even though everything is explained simply and clearly, more difficult exam-type questions are also included, thereby helping learners prepare for tests and exams. Learners who use the Grade 10 Maths 4 Africa study guide on a regular basis will find this book invaluable. It has been designed to help learners succeed. The Grade 11 Maths 4 Africa study guide is a true gem. It is an absolute must for both Grade 11 and 12 learners. In Grade 11, learners are introduced to lots of new work which can get complicated quite quickly if one doesn’t understand the basics well. The Grade 11 study guide offers step-by-step guidance throughout, enabling learners to keep up every step of the way. In Euclidean geometry, learners need to learn and apply a lot of new theorems, including writing down the correct reason whenever they apply one of these theorems. These include theorems dealing with tangents and quadrilaterals. The relevant chapter in the Maths 4 Africa study guide offers a summary of all of these theorems together with the correct reasons (all in accordance with CAPS) as well as a simple example of each before moving on to worked examples similar to those that might be encountered in tests or exams. Colourful sketches along the way serve as a further visual explanation of what is being done. In the section on trigonometry, learners are introduced to various types of trigonometric equations, as well as finding the general and specific solutions of equations, which could all be quite daunting. Once again, the Maths 4 Africa study guide comes to the rescue, offering an organised summary of all these types of trigonometric equations as well as a simple worked example of each before moving on to more difficult examples. Furthermore, learners could find working in the various quadrants and proving trigonometric identities a bit tricky at first, but this study guide sets out everything in a manner designed to simplify this work. The sin, cos and area rules, as well as the application of these rules, are dealt with in Grade 11 for the first time. The Maths 4 Africa study guide explains these in a simple, straight-forward manner, thereby ensuring that learners understand how to apply these rules. In the section on trigonometric functions, a detailed summary of the equations of the different functions is provided, explaining what each parameter means. Step-by-step explanations show learners how to draw graphs of trigonometric functions using a calculator. Using exam-type questions in worked examples, learners are also taught how to interpret trigonometric graphs and equations of such graphs. A lot of learners find Grade 11 exponents and surds complicated. The Maths 4 Africa study guide shows learners that this section is actually not difficult at all. Helpful tips and detailed worked examples enable learners to really understand this work. The nature of a quadratic equation’s roots and quadratic inequalities are two more sections which learners often find daunting. Once again, there is absolutely no need for that. This study guide explains everything like a patient, resourceful tutor. In number patterns, learners are introduced to a new type of pattern, namely quadratic sequences. This is explained simply and clearly using colour and helpful tips whenever appropriate. Exam-type questions about quadratic sequences are dealt with in the form of worked examples. Learners are also shown important examples of mixed sequences, which are often encountered in tests or exams. In the section on functions, learners need to be able to deal with horizontal shifts of parabolas, hyperbolas and exponential graphs in addition to vertical shifts and reflections. This study guide carefully explains everything that learners need to know, using clever tools to illustrate what is being done. Financial maths is made easy in this study guide. Learners are shown what to do if interest should be compounded daily, weekly, monthly, quarterly or semi-annually instead of annually. Worked examples include depreciation, time lines and the conversion of nominal interest rates to effective rates (and vice versa). This ensures that learners cover everything they need to know about Grade 11 financial maths. In statistics, learners are introduced to a couple of new concepts. 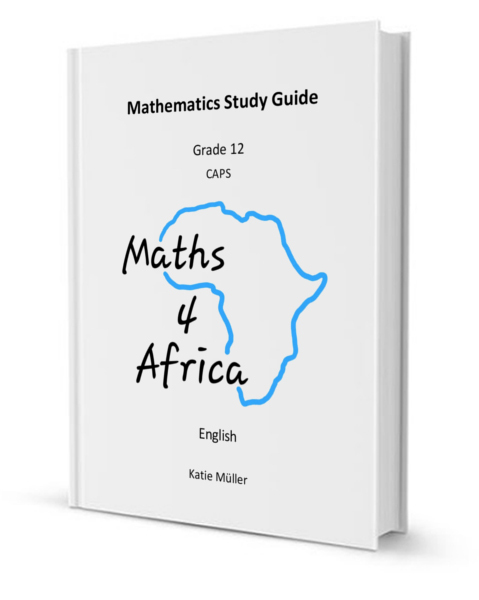 Using helpful summaries and worked examples, the Maths 4 Africa study guide makes quick work of enabling learners to easily understand this work. Step-by-step guidance is offered to show learners exactly how they should use their calculators in this section. Furthermore, at the back of the study guide, learners are provided with the proofs of all the theorems they need to know for Grade 11. This means that they won’t have to run around in circles to find these proofs before exams, as these can simply be found in the Maths 4 Africa study guide, all put together at the back of the book. As in all other chapters, colour and helpful tips are used to keep things simple and easily understandable by highlighting important steps. Everything Grade 11 learners need to know according to CAPS is covered in this study guide. These guides are learner friendly and aim to make Maths as easy as possible for its readers while ensuring that learners cover everything they need to know, including more difficult types of questions in each section. In this way, the Grade 11 Maths 4 Africa study guide helps learners prepare for tests and exams in an effective manner aimed at achieving success. In Grade 12, learners are confronted with a lot of new work in addition to having to revise Grade 11 work before their exams. That is why it is important to keep up and to never, ever fall behind. Learners should make sure that they understand all new work being taught as they go along. In all of this, the Grade 12 Maths 4 Africa study guide is simply invaluable. In Grade 12, learners need to be able to work with different formulae for arithmetic and geometric sequences and series in addition to quadratic sequences as studied in Grade 11. Mixed sequences add an extra twist, and learners are also introduced to sigma notation. All of this is made simple in the Maths 4 Africa study guide, which offers exam-type questions in worked examples. The methods used are carefully explained using helpful tips, colour and highlighting. The concept of inverse functions, including switching between exponential and log functions (also graphically), could be quite daunting. However, this study guide focuses on explaining and illustrating everything in a simple manner aimed at enabling learners to understand the work and apply their knowledge and skills. In financial maths, two important new formulae are introduced. Learners are often confused by tricky time periods with regard to investments and loans. They sometimes feel that there seems to be a never-ending range of different scenarios and they never seem to know when to apply which rule. However, the Maths 4 Africa study guide makes quick work of explaining this section in a way which is easy to understand. Each type of problem is offered as a different scenario, and each scenario is worked through in the form of a worked example. All different types of scenarios are covered. In this way, learners can see exactly how one scenario differs from another and how they should deal with each. In the chapter on trigonometry, the different types of trigonometric equations that could be encountered are revised before moving on to compound and double angles. As in the rest of the book, the worked examples are invaluable as they also show learners how to tackle tricky types of questions. Many learners struggle with three-dimensional trigonometry – they find it difficult to differentiate between triangles in different planes. This chapter in the Maths 4 Africa study guide carefully explains how to go about such problems using colour, helpful tips and step-by-step explanations. When it comes to polynomials and differential calculus, this book is a real lifesaver. It shows learners exactly how to factorise cubic expressions in a quick and easy way and deals with the application of the remainder and factor theorem in a practical manner. The worked examples include exam-type questions, which learners will find very helpful. In the sections on limits, differentials (derivatives) and gradients, various important examples are included, all accompanied by helpful tips and using colour to emphasise important concepts. By doing so, the study guide helps learners understand exactly what to do in each case. With regard to cubic graphs, the Maths 4 Africa study guide highlights areas which learners often seem to struggle with and offers this information in a simple yet effective way, summarising important concepts along the way. Once again, various worked examples are provided to ensure that learners encounter and learn how to deal with all sorts of problems. Learners often find the link between a graph and the graphs of the original equation’s first and second derivatives quite difficult. This study guide takes time to show learners exactly how these are linked. Colour, concise notes and tips, simple sketches and worked examples based on exam-type questions are used to show the connections between these three types of graphs. The way this section (as well as the section on tangents to graphs) is explained in a manner which learners can easily understand is invaluable. Furthermore, learners often struggle with the application of differentiation in practical problems. The Maths 4 Africa study guide makes quick work of showing learners how simple it actually is to apply differentiation in various scenarios. In analytical geometry, learners are introduced to circle geometry, which is new to Grade 12. Important and tricky aspects are pointed out to learners and they are shown exactly how to approach these types of questions. When it comes to Euclidean geometry, many learners are quite lost. In Grade 12, learners work with proportionality and similarity in addition to applying the theorems studied in Grade 11. The Maths 4 Africa study guide carefully explains this work using various worked examples. Colour is cleverly used to help explain tricky concepts. Furthermore, sketches in worked examples are repeated in successive subquestions in order to show learners exactly what is being done in each new subquestion. This way, the writer was able to use colour extremely effectively to show learners the different steps of solving these problems. A large variety of worked examples are provided, giving learners the opportunity to really get the hang of this work. In the chapter on statistics, Grade 12 learners are introduced to the concepts of regression and correlation in a quick and easy manner. Using worked examples, learners are shown exactly how to use their calculators to find the standard deviation, the correlation coefficient and the equation of the regression line, and how to easily draw the regression line. The chapter on probability is absolutely great. In Grade 12, learners move on to applying the fundamental counting principle and using factorial notation. Learners sometimes find this section quite tricky, but the Maths 4 Africa study guide once again makes things easy. Colour, helpful tips and even clever little sketches are used to help learners understand and apply these new concepts. Furthermore, at the back of the study guide, learners are provided with the proofs of all new theorems they need to know for Grade 12, both for paper 1 and paper 2. (The rest of the proofs they need to know can be found at the back of the Grade 11 Maths 4 Africa study guide.) This means that they won’t have to run around in circles to find these proofs before exams, as these can simply be found at the back of the Grade 11 and 12 Maths 4 Africa study guides. As in all other chapters, colour and helpful tips are used to keep things simple and easily understandable by highlighting important steps. Learners who use the Grade 12 Maths 4 Africa study guide on a regular basis most certainly have an advantage over those who do not do so.